I am trying my hands on infusing herbs with oils. In this experiment, I decided to use dried Arnica flowers with organic Olive oil. Some herbs, such as Calendula, Arnica work better when dried while herbs such as Comfrey, St.John Wort work better when fresh. As a certified Aromatherapist, I know Arnica is excellent for bruises, inflammation, sore muscles, injury and joint pain. I normally use 100% pure essential oils to address these concerns. Instead of regular carrier oils, such as Jojoba, Almond or Avocado oil, using Arnica infused Olive oil in my sports blend and massage oil will definitely increase its healing power. After much research and based on my years of using Chinese herbs as medicines, I pact half of a bone dry glass jar with dried Arnica flowers. Be careful when handle dried Arnica flowers which are fluffy and fibrous. They can be irritating to the nose, which is exactly what happened to me! My nose started getting itchy. Next time, I will wear a mask! (haha) I then poured the Organic olive oil into the jar while using a wooden stick (plastic is fine too. Do Not use metals when handling essential oils and herbs. This is itself worth a blog) to gently stir around so that the oil is dispersed evenly through out the jar. Make sure the herbs are completely covered with oil and there is little head room to prevent oxidation and spoilage. Next, leave it in the warm area, preferably in the direct sunlight for two or three hours a day. 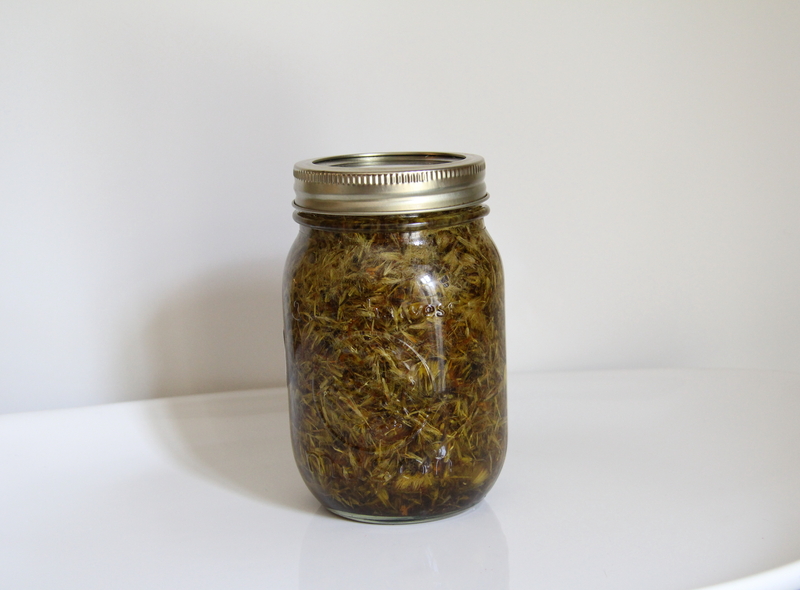 Shake the jar gently once a day for the first week to ensure that the herb releases precious healing oils. Leave the herbs infused for 4-6 weeks. 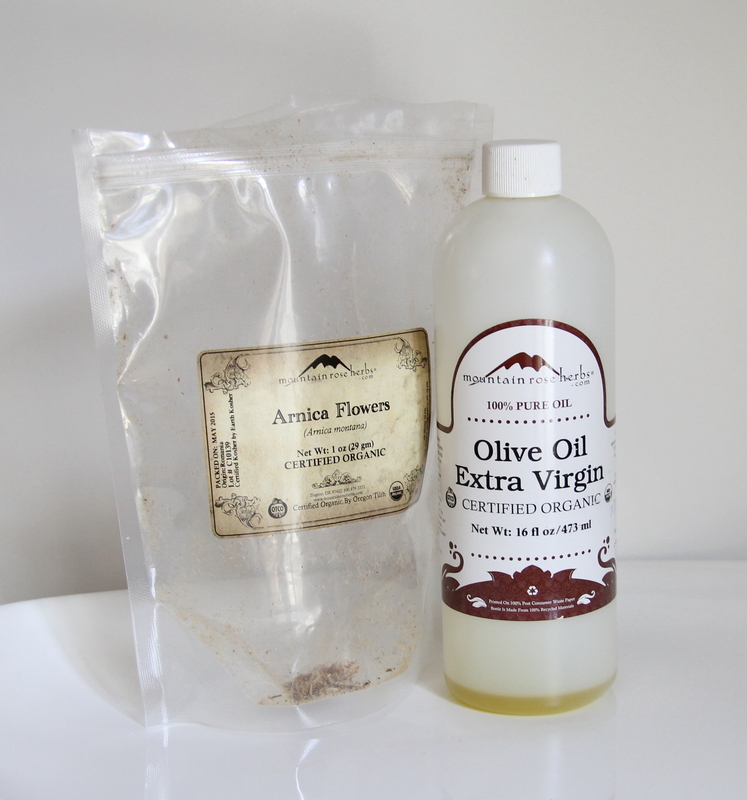 I purchased Arnica flowers and Organic Olive oil from Mountain Rose Herbs. Their Organic Olive oil is not chemically processed and smells amazing! As you can see from the picture, I was very anxious to make the infusion that I forgot to take the picture before use. Now, you see the empty packages! Here is the picture of what I did. In a few weeks, I will update the end product. I am so excited and am looking forward to a wonderful Arnica infused Organic Olive oil! +++++++++++++++++++++++++++++++++++++++++ If you have a specific concern that you want to address with 100% pure, authentic essential oils, but are not quite certain if you are using the appropriate oils with the right dosage, I am the one whom you can turn to for knowledge, expertise and experiences. As a NAHA certified Aromatherapist, I have been using essential oils for many years for families, friends and clients. As a mother of two, I have lots of experiences addressing various childhood concerns successfully by incorporating essential oils. Please don’t hesitate to contact me if you have any questions.